The Korean nuclear issue dates back to the mid-1960s, when the Democratic People's Republic of Korea (DPRK) acquired its Yongbyon nuclear reactor from the Soviet Union. The DPRK announced to withdraw from the Treaty on Non-Proliferation of Nuclear Weapons in 1993, making it a "powder keg" in Northeast Asia since the end of the Cold War. However, when people talk about the Korean nuclear issue, they usually focus on specific issues, and miss the bigger picture. These specific issues include the DPRK's natural disasters, the death of important figures, power transition, the development of nuclear weapons and missiles, provocation and interaction with the Republic of Korea and the United States. A case-by-case approach to the Korean nuclear issue begets short-term or makeshift solutions, which can cool down the situation temporarily, but foster the next round of fermentation and proliferation of the issue. The Korean nuclear issue cannot be solved by expedient solutions. What is the bigger picture of the Korean nuclear issue? The essential aspect of the issue is the geopolitics and regional security of Northeast Asia. The key points are whether the DPRK has the ability to develop the so-called nuclear deterrence power, whether it makes up its mind to become a nuclear state, how the answers of the two questions will influence regional security in the peninsula and the whole of Northeast Asia, America's role in the security frame in Northeast Asia, and how the Korean nuclear issue will influence interactions among the countries in the region. The DPRK has so far conducted four nuclear tests. 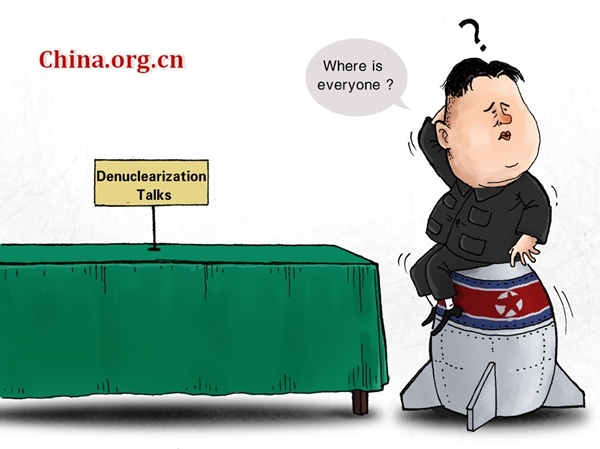 There are always similar questions following a test, particularly, whether the "nuclear test" was an explosion of conventional ammunition, whether the DPRK has the ability to test a uranium bomb and whether or not it was hydrogen bomb explosion on Wednesday. When talking about the Korean nuke issue, people usually focus on specific issues.